I started the week with $1.67 surplus. Cat food. I actually had a store credit at Target for a return I made last month, so I saved $4.05 off my purchase. When I looked at my reciept at CVS I realized I hadn't factored in the extra 5c per bottle they charge in the state of California for the redemption value. It then struck me that I had cans and bottles sitting around the garage. It was like FREE money! Even though I spent no cash on Friday, my gas tank was on E and I needed a birthday gift for a little boy in E's class. I had a Toys R Us gift card for $25 and I knew if I got my balance below $10 I could get the difference back in cash. So I purchased a $14.99 Transformer for the party, and used the remaining change ($8.96) to put about 2 gallons of gas in the van. All in all this week was MUCH MORE DIFFICULT. If it weren't for figuring out way to increase the amount I could spend I would not have been able to get through it. I am starting to run out of options for generating extra spending money. Dude, you're some sort of maniacal genius. Using the gift card for cash back? Well played. 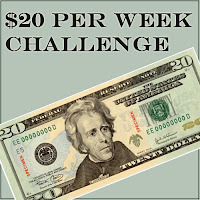 Although I'm not going to let hubs see how you budget with only $20 a week. Because I'm pretty sure I couldn't do it!